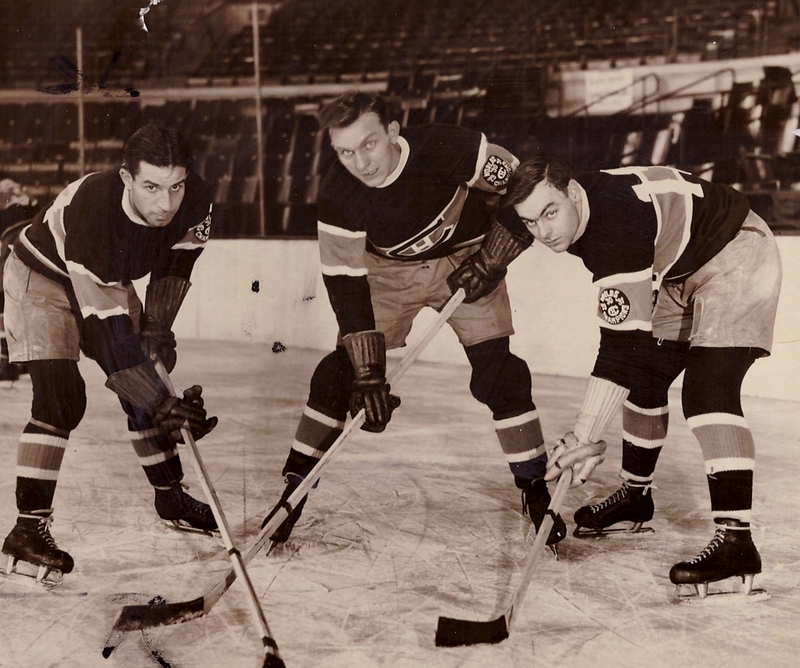 Montreal Mite: On early 1930s ice, left to right, Johnny Gagnon lines up with Canadiens teammates Gus Rivers (a fellow right wing) and defenceman Sylvio Mantha. Joliat and Gagnon are two of the lightest men in hockey. Their skates are not the light regulation aluminum blades, for fear they would go right up into the rafter some night, so rumor has it. But that’s likely an exaggeration. You know how newspapers are. It seems, though, that the little fellows are jealous of their weight, each scheming to be the lighter. Joliat is the taller and looks the heavier. But Gagnon doesn’t take anything for granted in hockey, which is ordinarily a wise precept. One night in Montreal the gamecocks almost came to blows over the question. Joliat shook his gauntleted fist under the Gagnon nose, stopping to get the low altitude, and Gagnon just spluttered back in French. “Jump on the scales!” taunted Joliat, his volatile nature uppermost. “Do it yourself!” screamed Johnny. So it was arranged. It was a simple question to settle beyond further dispute. The athletes were naked. Possibly there was one more soapsud on Joliat than on Gagnon, but Gagnon wore a drop of perspiration to make up for it. Johnny was first on the scales. “One hundred and thirty-nine pounds,” intoned the voice of the weigher. A slight sneer mantled Joliat’s lean bronze face as he lithely took Gagnon’s place. “One hundred and thrity-six,” cried the voice of the weigher once more.